Some weeks ago, IoT startup Loginno was invited to discuss their solution with SAP CEO Bill McDermott. Loginno Co-founder Shachar Tal expresses his excitement as followed: “When we signed our agreement with SAP, we had no idea how well we fit into this leading organization’s strategy, and certainly did not expect to be handpicked to meet the global CEO.” We spoke to the man who pulled the strings in the background. 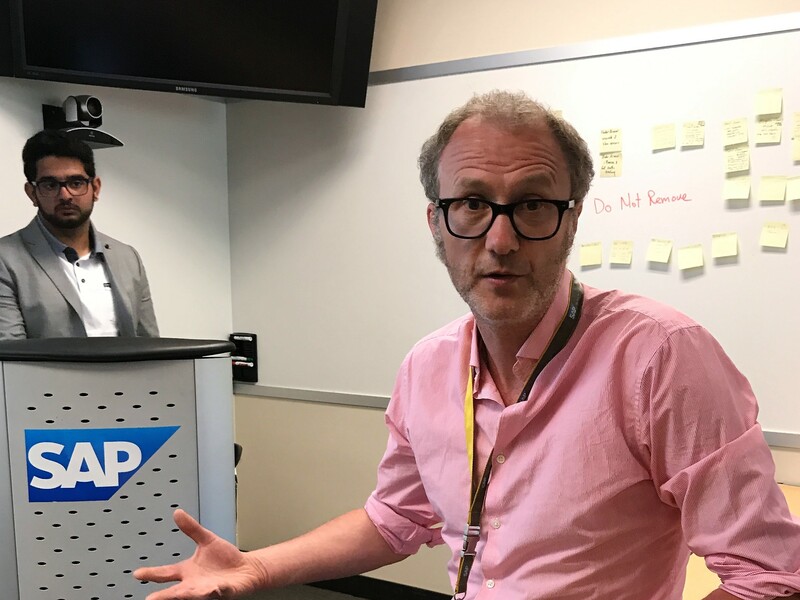 Dr. James Crawford who is part of the SAP IoT Startup Accelerator worked for the last eight months not just on combining the solution of the logistics startup with SAP technology but also helped them to refining their product. Back in March the combined solution was featured for the first time at dkom Israel. dkom is SAP’s annual global development meeting series. James and Shachar presented on stage with Dr. Tanja Rueckert who heads IoT at SAP. Read the insights of the Loginno SAP story in our interview with James. James, from what we heard your work made the startup Loginno famous. Could you tell us more about it? I’m proud to have played a key role in making them famous. The Loginno story is a concrete example, on many levels, of the new SAP and how we are engaging with the startup ecosystem to ensure that as a company we are innovating quickly and supporting our customer’s digital agenda. In respect to making them famous, it is a multi-disciplinary effort and it demonstrates how SAP colleagues collaborate to ensure the best possible outcomes. While I’m happy to take some of the credit for Loginno’s success, colleague Laurent Fratty in Ra’nanna from SAP’s field has provided fantastic business support. I really have to emphasize that such a multidisciplinary offering is key, having mentored hundreds of startups over the past four years I have seen that combining SAP business experience and technology with innovative startup solutions we can deliver tremendous value to our customers. James and Shachar with Tanja Rueckert in stage at dkom Israel. How did it all start with Loginno? I remember it well [he smiles and you can see that he thinks of something great]. Towards the end of last year, a very excited Laurent Fratty introduced me to a hardware startup called Loginno. They had developed a truly innovative device that could be easily retrofitted to the tens of millions of shipping containers that exist globally. Loginno was on the hunt for partners with whom to integrate these devices and ultimately support the logistics functions of the enterprise. Since our IoT Startup Accelerator is invite only we discussed the hardware as well as the opportunity for Loginno, SAP and our customers. As with all engagements of this nature, we focused on identifying a win-win scenario for all concerned. It struck me during these conversations, that Loginno had identified a white space in the supply chain that had the potential to support SAP’s digital strategy for our enterprise customers. Obviously, these are bilateral engagements so in addition to focusing on Loginno, we discussed the value for startups in partnering with a large enterprise such as SAP. At SAP, we are truly passionate about adding value to customers and we know that no customer embarks on a digital journey because it’s cool, it must impact their bottom line. While hardware facilitates adding value it is not a means to an end – services are the true digital enabler. I recall raising this with Loginno and that they needed to shift their focus from just hardware to primarily focusing on providing a service to their customers. An area we at SAP could support them in. [He smiles cheekily] I guess these discussions went well considering we are doing this interview. What exactly does Loginno do? And who are they? I have to answer this in two parts: who were they when we initially met and who are they now. When we first met, Loginno was a hardware startup who had developed an innovative device that could be retrofitted to dry shipping containers, enabling shipping companies to turn dumb shipping containers into smart containers overnight. The bottom line is they were primarily a hardware based startup. That brings me to who they are now. 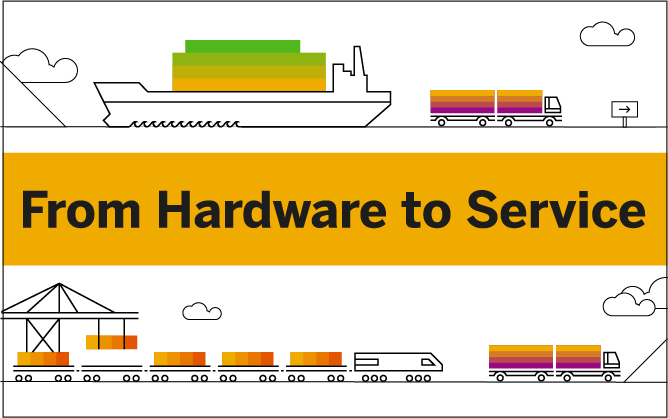 Because of working with the SAP IoT Startup Accelerator they are now first and foremost a service based company, providing services that remove shipping container blindness. This change in view point demonstrates that Loginno gets the fact that hardware is a facilitator. It reminds me of the maxim: Software is eating the world and hardware is giving it teeth. The name Loginno stands for Logistics Innovation and they are an Israeli based startup founded by Shachar Tal and Amit Aflalo. Shachar wears the business hat and Amit is the technical genius behind the AGAM device. What is the AGAM device? The AGAM device is the hardware that Loginno has developed, it really is an innovative piece of kit. The use of military grade hardware components ensures it is robust and reliable and the battery life is maximized due to innovations such as an SMS based protocol, and its simultaneous internal and external access. One of the aspects I really like is the fact that it is installed by replacing the shipping containers vent, this ensures that technicians working with containers are familiar with its installation process. It’s as easy as removing and installing a container vent. I recall being impressed with the simple fact that the device is placed at the vent meaning it has access to the inside and outside of the container. Those of you interested in physics may recall the principles of Faraday’s Cage, which incidentally is often used to block communications. Since a shipping container is basically a large Faraday Cage having simultaneous internal and external access means there is one less challenge to overcome. In my opinion, the fact that Loginno has patents on this is a huge, huge plus. What are the benefits using the Loginno solution? As I mentioned earlier the Loginno solution addresses shipping container blindness, a significant problem in the supply chain. It provides end users with real-time information to such questions as: where is my container, will it arrive on time, did someone touch my cargo? 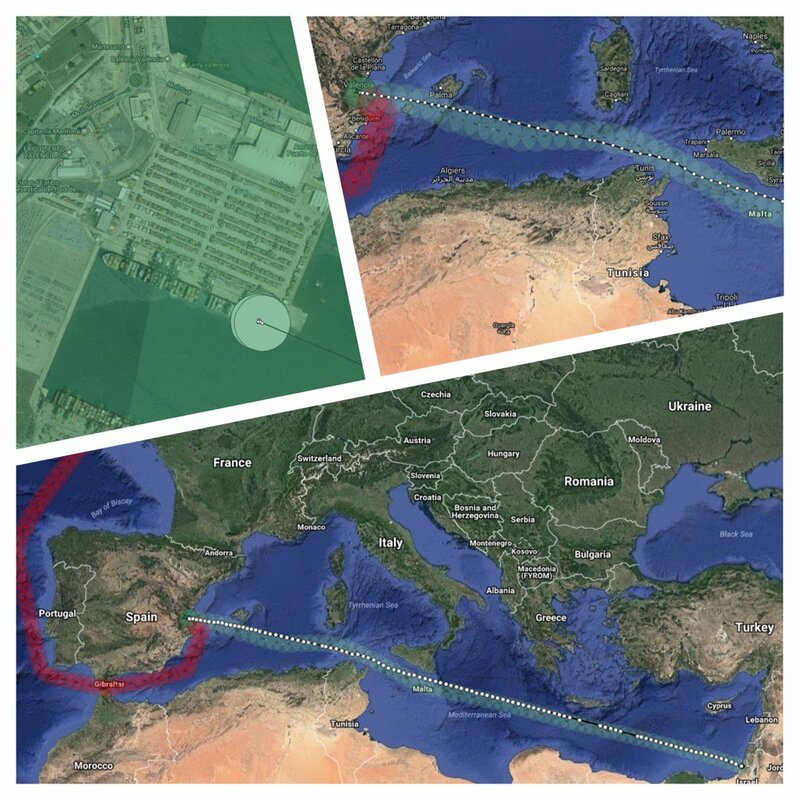 The solution also reports, in real-time, on the integrity of cargo with respect to such parameters as temperature and excessive shock for temperature sensitive and fragile goods. One neat aspect are the intrusion detection capabilities which means that once a container has been stuffed and armed, the location and time of unauthorized intrusions can be detected and reported. We can generate a digital seal for the containers journey. This has fantastic potential in areas such as customs and homeland security. Just to put all this in perspective, there are about 100 million container trips per year carrying cargo worth six trillion dollars. It’s estimated that up to 50 billion dollars is wasted each year on inefficient logistics. That’s what I call a win-win opportunity for Loginno, SAP and, our customers. What was it, that convinced you to work with Loginno? The team, the product, the opportunity and, the fact that Loginno really got the benefits and the mechanic of partnering with SAP. I know this deviates from other folks in the ecosystem who would possibly have answered a similar question with the team, team, team. But I think the additional points are extremely important and a direct reflection of the team. Oh and of course [with a broad smile he says] the challenge of not coming second to the other, previously mentioned, enterprise who were interested in Loginno. How was it to work with Loginno? Truly exciting. Seeing their change in focus from a hardware company to a company that provides an enterprise grade service was real high point. Also, the traction they are getting with folks like Bill, Bernd, Tanja, the field and various product teams is a real buzz and totally negates all the frustrations, late nights and challenges we faced. As with any disruptive technology it certainly pushed us (my colleague Yadu Basra and me) out of our comfort zones, but that’s where the team excels. James and Yadu presention Loginno technologie to the accelerator team in Palo Alto. What is so special about Loginno that even Bill McDermott invites them and Tanja Rueckert presents on stage with them? The team. Once you meet Shachar you couldn’t but be excited by the passion he exudes backed up by the technical brilliance of his co-founder Amit. It’s truly infectious, the whole package. At dkom it was apparent that Tanja was impressed with Loginno. 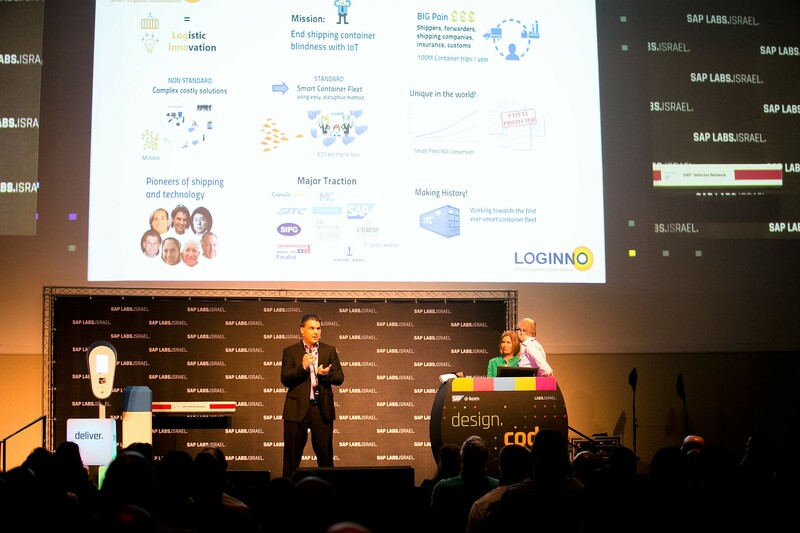 Loginno’s solution does exactly what it says on the tin, it is a stand out example of SAP’s ability and desire to innovate with the global startup ecosystem. The execution of the engagement also demonstrates how internal collaboration between technology and the field can contribute to SAP’s success. I guess they saw the fact that it encompasses the spirit of SAP’s Leonardo brand from a technical and innovation perspective, and from a result based perspective. Regarding Bill, I guess you should ask him the question. But if I were to be so bold as to try and second guess, on two levels, how he thinks. I would say from a sales perspective it brings him back to his roots and he see – in caps, bold and quotes REAL OPPORTUNITY. And as the CEO he sees all that is good about SAP and its strategy. An innovation model that delivers, true alignment with SAP’s focus on the cloud and cloud based services, and as I mentioned he sees an incarnation of the Leonardo brand and all it stands for. What are the next steps for Loginno? As it stands Loginno has developed an MVP (Minimal Viable Product) running on the SAP Cloud Platform. We have successfully conducted live trials between Israel and the UK. Loginno is getting real traction with both customers and SAP’s field organization. Just talking about it I can feel the excitement. In the short term, we are focusing on three areas. Supporting the many interested customers who see the value in removing shipping container blindness. There is for example a large intra-Asia shipping company with whom we are due to start a proof-of-concept. In parallel we are exploring how Loginno can leverage the data that is being generated by the AGAM device. In that regard watch this space and expect exciting news very soon. I am truly excited and amazed at the diverse customer interest, such as insurance, and, as follow-on with some of the new services that are being considered. If data is the new oil Loginno is both the oil rig and the refinery. The third focus is on enabling a truly digital supply chain which requires deeper integration with relevant SAP products and moving further down the supply chain to support real-time visibility into individual items that are carried by the shipping containers. For news on the Accelerator go to their Twitter Channel and Youtube. And don’t forget to check out Loginno’s platforms: Twitter and loginno.com. You will meet James and Shachar at the SAP Leonardo Live Event. Loginno road map of realtime tracking containers.